Sometimes pain is caused by tension, sometimes it is overuse, and frequently it is caused by trauma and injury. We can mask it with pain medicines, or take anti-inflammatory medicine to reduce the pain, but in order to get relief from the pain, we must first, discern what we have done to cause the discomfort, and second, take some action on that information in order to relieve pain. Massage and Manual Therapy aid in both finding the cause, and stabilizing the involved tissues. Pain relief is often found by soothing our muscles with massage. Sometimes it requires a more specific, or direct manipulation of the injured or traumatized tissue. Either way we act to find out what works best for you, and that is the best we can do. There are many causes for low back pain. Lumbar pain makes everyone’s life difficult. Sometimes we injure the musculature through over exertion, like lifting something to heavy while twisting, or by not using our legs correctly. However, my experience shows that more often than not, it is the shortening of muscles that cause low back pain. With low back injury, there is no limit to possible causes. Manual therapy is a holistic approach, and challenges the therapist to look at the issue from as many viewpoints as possible in order to determine the true cause. We will treat the nerves, arteries, muscles, bones, and internal organs and find you the relief you are looking for. Headaches come in so many varieties; there are Migraine, tension, cluster, trigeminal, and sinus. There are at least 50 different types of headaches currently defined by the medical community. Each type of headache has a different cause. Some are caused when all the potassium in your cranium is pulled to the surface of the brain, some are pressure on nerves, some are from muscle tension, and others are a reduced blood flow to the brain itself. Manual therapy does its best to look at all the possibilities, listen to the body, and find the root cause of the pain. Joint pain of any kind can be such a burden, but I think knee pain is the worst of all. Some knee pain will require surgery, some will not. I can help with the non- surgical variety. One of my patients said this to me, “If Jim can’t fix it, then I will go to the doctor for an MRI, but I will always see Jim first.” Manual therapy will work to stabilize the joint, and make sure the joint has full mobility, and adequate blood flow. Then we will look at the muscles that may be putting a strain on the joint itself. This is the way we treat joint problems in a holistic way, getting you back to optimal health. Who has not had a stiff or sore neck? When it is bad, it is intolerable and is frequently accompanied by dizziness, blurred vision, and headache. I can become irritable and a burden to those who share my life. Let us just say that when we are in significant pain, we are not at our best, and want immediate relief. The neck is an exceedingly complex portion of the body, and any imbalance can throw the whole system into a fit. Manual therapy understands that the nerves, blood flow, muscles, fascia, and bones, all play a part in cervical dysfunction. A good manual therapist will listen to the tissues and determine what is pulling where, and release any adhesions until the neck is stabilized, At this point, after the muscles, arteries, nerves and ligaments have been addressed, we can gently and easily return any bones to their natural resting position. TMJ is usually caused by clenching ones jaw. This can happen while awake, or while asleep, and is largely an unconscious behavior. We are generally unaware of the problem until pain begins radiating across the temples of our cranium. TMJ involves the muscles and connective tissue of the neck, the cranium, and face. Manual therapy will address the connective tissue sheaths of the neck and head, as well as the nerves and arteries that supply the joint. Then we can treat the musculature from inside or outside the mouth, helping to wake the muscles, and retrain them to soften throughout the day. Correcting TMJ will likely involve some behavioral changes for you, and stretches each day to rebalance the dynamics of the jaw. Mechanical restrictions in our eye movement cause pain. Sinus or intra-cranial pressure can cause our eyes to ache. Even reduced blood flow can cause our eyes to tire easily, causing them to ache. These pressures and mechanical restrictions are regulated or removed with the hands of a skilled practitioner. First, we make sure the cranial bones are moving correctly, and then we insure the nerves and arteries are free and functioning properly. Once the surrounding tissues are at ease we can address the eyes directly with a light touch to free up restrictions within the musculature of the eye. Chest pain can be indicative of a heart attack. Since a heart attack is often fatal, anytime we have chest pain we think, “is this it?” Yet there are many causes for chest pain. The muscles can become tight and cause chest pain; indigestion can cause you to feel as though you are having a heart attack. Ribs, where they meet the breastbone, can be out of place making it hard to breath. Even the lungs and heart can become restricted, causing pain and difficulty breathing. In manual therapy, there is no tissue or restriction that cannot be treated. In cases like this, we try to discern if it is a structural problem or a visceral problem. Then we set about freeing lesion, softening muscles and organs, and the bony structure, until the chest can expand fully one again. Sometimes pain is caused by tension, sometimes it is overuse, and frequently it is caused by trauma and injury. We can mask it with pain medicines, or take anti- inflammatory medicine to reduce the pain, but in order to get relief from the pain, we must first, discern what we have done to cause the discomfort, and second, take some action on that information in order to relieve pain. Massage and Manual Therapy aid in both finding the cause, and stabilizing the involved tissues. Pain relief is often found by soothing our muscles with massage. Sometimes it requires a more specific, or direct manipulation of the injured or traumatized tissue. Either way we act to find out what works best for you, and that is the best we can do. Joint pain of any kind can be such a burden, but I think knee pain is the worst of all. Some knee pain will require surgery, some will not. I can help with the non-surgical variety. 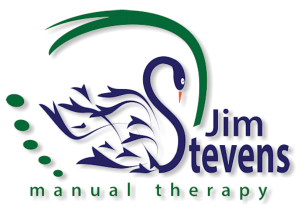 One of my patients said this to me, “If Jim can’t fix it, then I will go to the doctor for an MRI, but I will always see Jim first.” Manual therapy will work to stabilize the joint, and make sure the joint has full mobility, and adequate blood flow. Then we will look at the muscles that may be putting a strain on the joint itself. This is the way we treat joint problems in a holistic way, getting you back to optimal health.